Killer Characters: Banshee Is Not My Name! Banshee Is Not My Name! What is it with these humans and their need to assign totally ridiculous names to the animals that they serve? My name is not Banshee! I have no idea why my human Birdie Sinclair insists on calling me that. Okay, it’s not entirely her fault. Her husband brought me home to her as an anniversary present just before he died, and since he had plucked from my mother’s side, it’s entirely possible that I was upset. And like most Siamese cats, when I’m upset I vocalize that emotion. So perhaps when he stated that I was howling like a banshee, he might have not been entirely wrong. But still, do they call their human children little Shrieker? Come on I was only a kitten. Give a guy a break. I really never had a chance to demonstrate my calm, dignified self. Shortly after Birdie’s husband died, her granddaughter Devereaux Sinclair came to live with us. Was I consulted? No! It was bad enough that an obnoxious teenager moved in, but she brought a hamster or gerbil or whatever the heck it was with her. So I ate it. Hey, cats eat rodents. It’s a fact of life. Get over it. But since that little midnight snack incident, Dev and I have been at war. And let’s just say, one of us has fangs and claws and one of us doesn’t. So you guess who wins those battles. Just recently though, Dev did do me a solid. She brought home a cool cat named Tsar. He’s a Russian Blue and we get along famously. We both like the same things, lying in the sun, Temptation cat treats, chasing mice. Hey, I’m not saying it’s a romance, I don’t bat for that team—not that there’s anything wrong with that, but it’s nice to have a pal. Tsar says he’ll have to leave when his human comes back from vacation, but maybe I can persuade Birdie we should be a two cat family and she’ll get me a little brother. What? You want to know if Dev and I are still feuding? Well, yeah! In a small town like Shadow Bend, feuds don’t go away overnight. If you don’t believe me, ask Birdie if she’s forgiven Noah Underwood for what they did to Dev. So, is there anyone you can’t forgive? 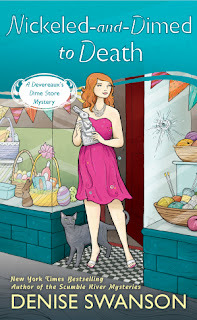 ---Denise Swanson is the New York Times bestselling author of the Scumble River and Devereaux’s Dime Store mystery series. Read more about Banshee in her March book, Nickeled-and-Dimed to Death. Woof! We don't understand cats. Dogs don't bear grudges. Woof! A Dime Store Mystery, what a wonderful thing. What do you want to be called instead of Banshee then? And a friend for you sounds like a good thing, perhaps you won't torment Dev so much.